'Do whatever is within your power to spread devotion to My Mercy, I will make up for what you lack. Tell aching mankind to come close to My merciful Heart, and I will fill them with peace"
Sister Faustina was beatified by Pope John Paul II on 18th April, 1993. Jesus said:- "Write down these words, my daughter. 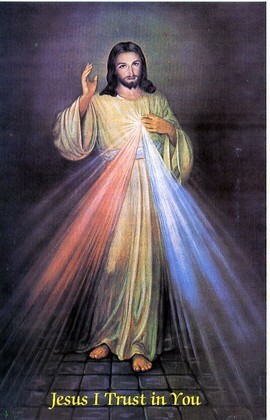 Speak to the world about My Mercy: let all mankind recognise My unfathomable mercy. It is a sign for the end times: after it will come the day of justice. While there is still time, let them have recourse to the fount of My Mercy: let them profit from the blood and water which gushed forth for them. As unpleasant or out-of-place some people may consider the thought of the "end times" to be, there is no way of avoiding the fact that today, Jesus is calling all mankind to turn with devotion to His Divine Mercy as a preparation for His return in glory. "Tell Souls who spread the honour of My Mercy I shield through their entire life and at the hour of death I will not be a judge for them, but the Merciful Saviour". "That beautiful soul who is spreading this work of Divine Mercy throughout the world is, by their deep humility, very pleasing to God. "Tell my priests that hardened sinners will crumble beneath their words when they speak about My unfathomable mercy, about the compassion I have for them in My heart. To priests who will pro-claim and extol My mercy I will give wonderful power, and I will anoint their words and I will touch the hearts to which they will speak". Jesus appeared to this humble nun bringing with Him a wonderful message of Mercy for all mankind. Sister Faustina tells us in her diary under this date: "In the evening, when I was in my cell, I became aware of the Lord Jesus clothed in a white garment. One hand was raised in blessing, the other was touching the garment at the breast. From the opening in the garment at the breast there came forth two large rays, one red, and the other white. In silence I gazed intently at the Lord, my soul was overwhelmed with fear, but also with great joy. After a while Jesus said to me: ' Paint an image according to the pattern you see, with the signature: Jesus, I trust in You." Some time later, Our Lord again spoke to her: "The white rays stand for the Water which makes souls righteous: the red rays stand for the blood which is the life of souls. These two rays issued forth from the depths of My most tender Mercy at that time when My agonizing Heart was opened by a lance on the cross... Fortunate is the one who will dwell in their shelter, for the just hand of God shall not lay hold of them." As a further sign of His forgiving love, Jesus called for a Feast of his Divine Mercy to be celebrated in the whole Church . He said to Sister Faustina: "I want this image to be solemnly blessed on the first Sunday after Easter; that Sunday is to be the Feast of Mercy. On that day, the depths of My Mercy will be open to all. Whoever will go to confession and Holy Communion on that day will receive complete forgiveness of sin and punishment. Mankind will not enjoy peace until it turns with confidence to My Mercy." Because of my sins, I don't deserve Your mercy, but ask you to remember Sister Faustina's Spirit of sacrifice and self-denial, and to be gracious to her faithful love of You by granting the petition which I make to You now, with childlike trust through her intercession. Amen. This Novena may be used at any time, but it should be said especially for her canonisation nine days before the 22nd February, the date when she first received the Image of Divine Mercy. God usually chooses the weakest and simplest souls as tools for his greatest works; this we can see when we look at the first men he chose to be his Apostles; or when we look at the history of the Church and see what great works were done by souls that were least capable of accomplishing them; for it is in this way that God's works are revealed for what they are, the works of God. Sister Faustina was born Helen Kowalska the 25th August 1925 in the village of Glogowiec near Lodz, Poland, the third of ten children. At the age of twenty she entered the Congregation of the sisters of Our Lady of Mercy. These sisters devoted themselves to the care of young women who were morally and materially impoverished. In 1934, in obedience to her spiritual director, Sister Faustina begun to keep a diary which she entitled "The Divine Mercy in My Soul." This detailed account of profound revelations and extraordinary spiritual experiences reveals the manner in which Our Lord entrusted to her a very special mission, namely, to announce to the world the message of, and new forms of devotions to, His Divine Mercy. 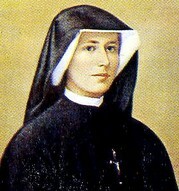 On the 5th Ocotber 1938, at the age of 33, Sister Faustina died, of a lung disease, in Cracow, one year before the outbreak of World War II, a war which she had foretold, even indicating its extent and horrors. and we trust in you.